Someday soon your Domino’s Pizza could be delivered to you — without an actual delivery person. Ford and Domino’s are testing out a specially-equipped Ford Fusion that comes not only with self-driving technology but also an oven. It sounds cool but there is a catch — there’s no one to walk the pizza to your front door and ring the bell. That’s what Ford and Domino’s say they’re really testing. During the testing phase, an engineer and a driver will be in the car — but the windows will be heavily tinted so customers can’t see them. And both have been instructed not to interact with people at all. Domino’s wants to see how well customers deal with coming out and getting their own pie from what is, basically, a pizza ATM built into the car. To get their pizzas, customers will have to enter a number on the touchpad, then a back window will lower, revealing the pizza. Over the next five weeks, randomly selected customers around Ann Arbor, Michigan, will be offered the option of getting their pizza delivered by the hi-tech “driverless” car. Instead of being handed a pizza customers will have to come outside to get the pizza of a warming oven built into the car. During testing on public roads, the driver will operate the vehicle. Ford is testing self-driving cars on public roads in other places but this test is really about customer acceptance of the technology, a Ford spokesman said, not whether the car can drive itself. Roush Enterprises, a company that frequently works with Ford (F) on a specialty vehicles, created the built-in pizza oven for the Fusion delivery car. Roush previously helped create a specialized Domino’s delivery vehicle based on a Chevrolet Spark. That car also had a built-in oven. Ford has been using Fusion sedans for some time to test self-driving technology. Experts have said that delivery services will likely be among the first industries to widely adopt self-driving vehicles. 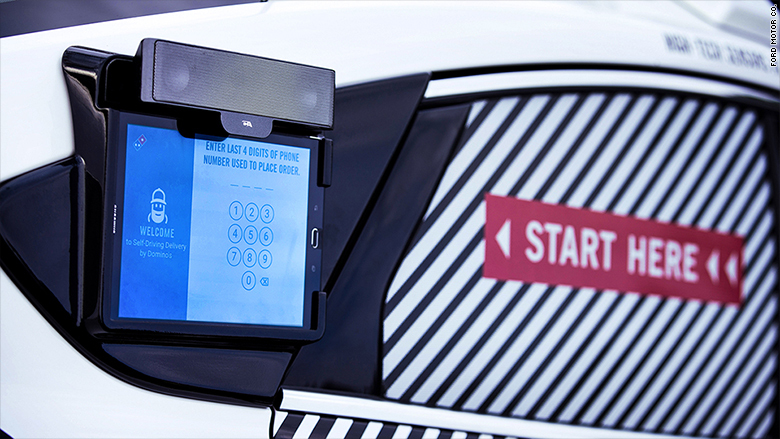 Ford and Domino’s did preliminary testing for the human-free delivery process at Mcity, a simulated city environment on the campus of the University of Michigan. During testing on the college campus, the cars were allowed to drive themselves although humans were still were in the driver’s seat.